**Dates shown are the first air date (Tuesdays at 3:30 pm). A second airing follows at 2:30 pm, Saturday of the same week. 100 Years of Horse Power—(REPEAT) Tom Renner hosts examples of farming from the past century, from walking plows to giant tractors (2018). Samson Harness—(NEW) Master harness maker, Bernard Samson talks about harness types and how to choose a good harness. (2019). Homeplace on Green River—(NEW) The Homeplace on Green River hosts its annual Spring Plow Day and Festival in Taylor County, Kentucky (2019). Deadwood Wagon Train - The Ride—(REPEAT) Teamsters and their horses spend a week travelling from Cheyenne, Wyo., to Deadwood, S.D. (2018). Deadwood Wagon Train - The Crew—(REPEAT) A behind the scenes look at organizing and executing a weeklong wagon train through the Black Hills (2018). Horselogging Living—(NEW) Horselogger Taylor Johnson explains how he thinks outside the box to make his living logging with horses (2019). Fieldwork on a Horsepowered Farm—(NEW) The John Davis family tills, plants and cultivates using draft horses on their Wisconsin farm (2019). Popcorn Day—(REPEAT) Charlie Tennessen draws on real-life to produce beautiful children's books about the donkeys on his Wisconsin farm, Anarchy Acres (2018). Wagons for Warriors—(NEW) Scores of traditional chuckwagons parade then cook and serve cowboy fare to raise money for US Veterans (2019). 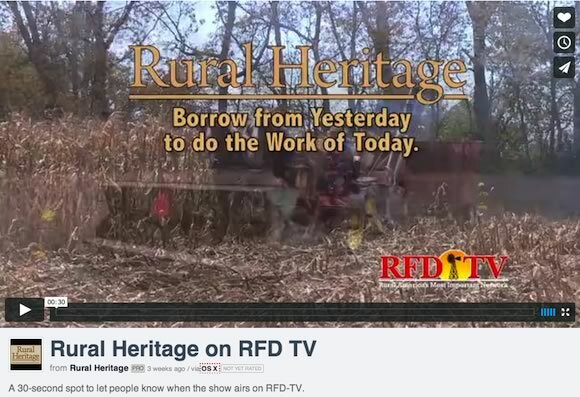 Click the RFD-TV logo above for a link to the RFD-TV Schedule and the Rural Heritage Hour. This file last modified: April 10 2019.